Strip the elderberries from their stalks, wash them, and put them with the raisins. Boil the water and pour it over the fruit, mashing it well with a wooden spoon. Stir in the sugar until it dissolves,and leave to cool. Then add the acid, yeast, and yeast nutrient. Cover securely and leave to ferment for five days sirring daily. Strain the liquid through a fine-mesh bag into a fermentation jar. Fit a fermentation lock cointaining sterilizing solution and put the jar in a warm place to ferment until the bubbling stops, the wine starts to clear, and the SG is close to 1.000. When fermentation has ceased, rack the clear wine into a clean fermentation jar and add a campden tablet. Rack again, as required, until the wine is perfectly clear. Allow the wine to mature for several months before bottling into dark bottles. Leave it for atleast 18 months before drinking. 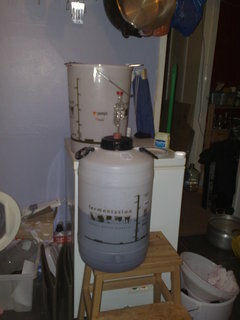 Batch 1: Racked off the 1 gallon into a clean demijohn, took a SG reading of 990. Added a couple of campden tablets and placed it back in the pantry. The taster I took came out very nice, if in need of again. Batch 2: Racking this wine off has been a small logistical nightmare. Having only the one 5 gallon wine fermentor meant that my usual technique of siphoning from one demi-john to another doesn't quite work. After alot of deliberations we had to settle for siphoning from the fermentor into the 5 gallon bucket, washing the fermentor, siphoning from bucket back to fermentor. 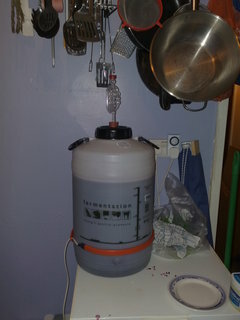 All in all relatively simple, except that it takes an age to siphon 5 gallons of wine, two ages to do it twice. In the process tho I took an SG reading and ended up with an SG of 990, so in went 6 campden tablets (I dropped one whilst crushing, so added a 6th). Should stop fermentation shortly, and start to clear. Shouldn't be long till I can start bottling. Bottling is another small logistical issue I am having. All in all I have 11 Gallons of wine in various states of fermentation (Not includeing 3 gallons from kits). If each gallon gives me the suggested 6 bottles of wine, I am going to need 66 bottles. I have begun collecting these from my local friendly bar, but even after 3 months, I am still 24 bottles short. Something makes me think this might take a while. What is compounding this however is that I am running out of space to store the empty bottles. My wine rack is full (room for 18 bottles), and I have already added another 18 bottles of capacity. Going to have to think about how to fit all of these bottles into the flat. Batch 2: Spent this evening transfering from the bucket where the must has spent the last week to the 5 gallon fermentor where it will spend the next 26 weeks. Having strained all the fruit off leaving just the liquid I had approximately 3.5 gallons of wine. I topped this up with a further 12 pints which I boiled up and dissolved the last 5lb of the sugar in. This was then added to the fermentor when it had dropped to <35°C, this done all that was left was to add the lid for the fermentor and an air lock. I say all. Getting the lid to seal was a bit of a pain and required a considerable quantity of vaseline to get a good seal. Once it sealed tho, the gas bubbling through the air lock is coming through strongly, with a discharge every couple of seconds or so. The gas coming out makes a wonderful gargling noise that can be heard over most of the flat. Nice to know it;s working. 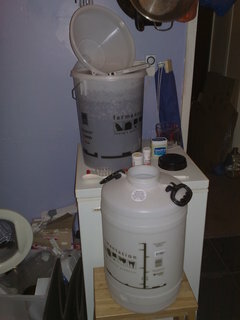 The only issue I have left now is to work out where I can keep a 5 gallon fermentor for the next 6 months. Due to a slight oversight, it doesn't fit in the airing cupboard. It needs a location that is dark and warm, preferably where the risk of it ever getting disturbed is nil. Will put some thought into this. For now tho, I am going to sit back with a glass of rosé. Batch 2: After a week of picking and destalking of 15lb of elderberries, we have now started a 5 gallon batch of elderberry wine. We are using the same recipe as the previous batch, but we are using 5 times the quantities. With the volume of berries at the start of this brew, there isn't enough space in the 5 gallon bucket for the full quantity of water. So at this stage we have put in 24 pints of water and 7.5lb of sugar. The must is now sat in the kitchen cooling down, I expect this quantity of liquid to take a number of hours to cool down to the point I can add the yeast. Batch 1:This has been by far the most complex attempt at bucket chemistry so far. Picking the elderberries proved interesting, if only from the point of view of the rippest berries appear to all be just out of reach... Filled the 1 gallon bucket twice to get enough berries by the time the stalks had been removed. But after a number of evenings in front of a film removing the berries from the stalks, I had the magic 3lb of fruit needed. Having weighed and measured all the fruit and put it in the bucket, I started adding the boiled water. With 6 pints of water in the bucket, the level was within half an inch of the top of the bucket, no where near enough room for some clearance above the must by the time the yeast gets going. After a consultation with a friend I finally decided to move some of the must into a sealed tupperwear box to continue it's juicing, I will add it back to the rest when I strain the must into the demijohn. So now I am awaiting the must that is left in the bucket to cool down to a blood heat so I can add the yeast, yeast nutrient, and citric acid. As another deviation from the recipe, I am using lemon juice instead of the citric acid. I hope it has the desired effect. This page last modified Monday, 18-Jan-2010 03:09:43 CET.